The Cloudcast - Eps.68 - "Disrupting Open, Unified Storage with Ceph"
The Cloudcast - Eps.66 - "Developing Apps for the Public Cloud"
It's been a while since we updated The Cloudcast (.net) channel on YouTube, but we recently created some new videos. 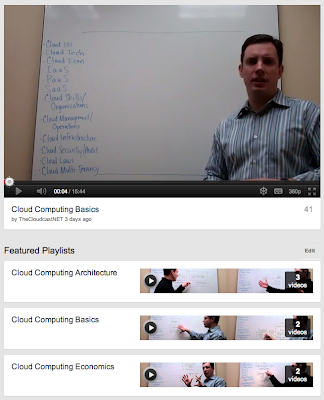 We hope you enjoy them, and we welcome any suggestions for new topics to cover on future whiteboard videos. The Cloudcast - Eps.64 1/2 - "The Cloudcast Gives Back - Charity Challenge"
This year we're taking our ability to give back and have fun at the Krispy Kreme Challenge to a new level. We're asking our listeners to (jointly) help us make a donation to the sponsor of the event, North Carolina Children's Hospital. They do amazing work for kids in need, and we'd like to help them make a few more lives better. We're setting a goal of $1000 in listener donations, and Aaron and Brian will match $1000. Every little bit helps, and donations are tax deductible (US laws apply). We'll do the training, run the miles and suffer the consequences of sugery gluttony. You listen to the show, give a few $$ and maybe tell a friend. We all help make the kids lives a little better. It's a win-win for everyone involved. If anyone wants to join us on the run, you're welcome to join the Cloudcast pack (12 donuts is optional). If anyone has creative ideas for costumes that Aaron and Brian should wear, we're open to suggestions. If anyone can get matching corporate sponsorship for the donations, all the better. The Cloudcast - Eps.63 - "The Cloud Foundry PaaS Ecosystem"
Ever since we started the podcast in 2011, we've tried to have fun and give back. With the weekly show, we feel like we give a little bit back to the technology community that is interested in cloud computing. This year we're taking our ability to give back and have fun to a new level. We're asking our listeners to (jointly) help us make a donation to the sponsor of the event, North Carolina Children's Hospital. They do amazing work for kids in need, and we'd like to help them make a few more lives better. We're setting a goal of $1000 in listener donations, and Aaron and Brian will match $1000. Every little bit helps, and donations are tax deductible (US laws apply). We'll do the training, run the miles and suffer the consequences of sugery gluttony. You listen to the show, give a few $$ and maybe tell a friend. We all help make the kids lives a little better. It's a win-win for everyone involved. If anyone wants to join us on the run, you're welcome to join the Cloudcast pack (12 donuts is optional). If anyone has creative ideas for costumes that Aaron and Brian should wear, we're open to suggestions. If anyone can get matching corporate sponsorship for the donations, all the better. Topic 2 - Puppet is one of the tools that is often mentioned as being central to the DevOps movement. We are we with DevOps in the industry at this point? How well understood is it, where is it most widely used, and what are the next big hurdles to overcome? Topic 3 - Often times you’ll hear people say “Chef or Puppet” when talking about aspects of automation. Like most toolsets, people tend to have their favorites and various reasons why they prefer one vs. another. (a) Why do you hear that people choose Puppet vs. other toolsets? VOTE for The Cloudcast (.net) Fantasy Cloud Winner and Loser!! Top Blog / Podcast Video Results - Thank You For Voting! 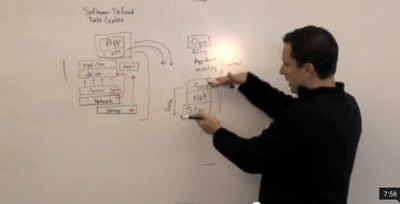 Mike Foley was previously on the podcast talking about security in a vCloud Director environment at VMworld 2011. 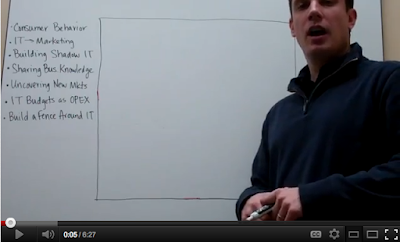 This week we decided to add something new to the podcast, so Mike and Brian did a whiteboard video of their discuss (see below). 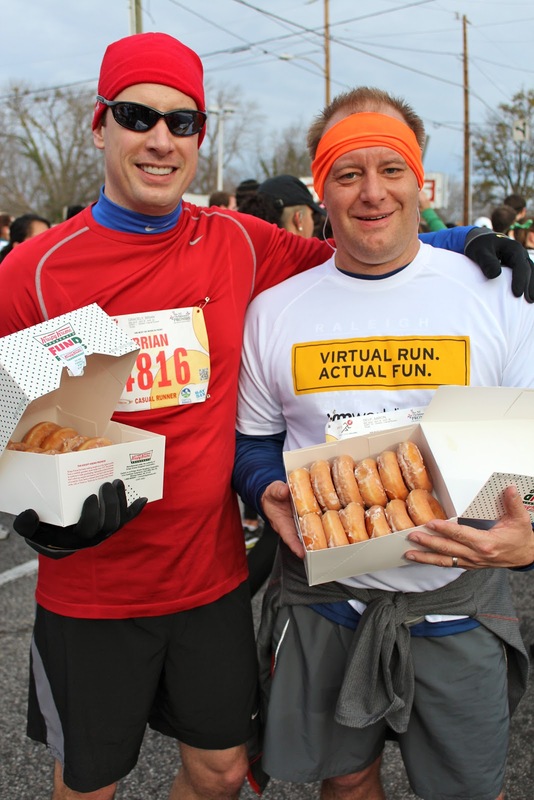 On the morning of February 4th, 2012, Aaron and Brian competed in the Krispy Kreme Challenge. This is an important milestone for the podcast because it marked the One Year Anniversary of the show. They decided to capture their results in the show video below. The guys had a great time during the race, and they hope you enjoy this short video.